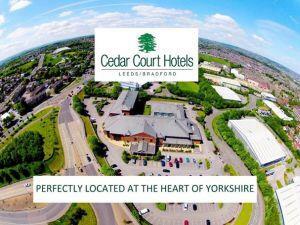 Cedar Court Hotel Bradford/Leeds at BW Cedar Court Hotel Leeds / Bradford08454 090467workGroup AccommodationLocated right at the heart of the M1/M62 motorway network, Cedar Court Hotel Leeds/Bradford is in perfect proximity of both these vibrant Yorkshire cities. All bedrooms include en-suite facilities, a welcome refreshment tray, free Wi-Fi, a flat screen television, 24 hour room service, hair dryer, trouser press, and all those essential bespoke bathroom toiletries. Enjoy an informal and relaxed meal in the lounge or experience a broad range of locally sourced produce in the Four Seasons Brasserie. All residents will have access to complimentary car parking and use of the Health Club. Nearby attractions include the National Media Museum, the Alhambra Theatre and within 12 miles you could visit the UNESCO World Heritage town of Saltaire, the home of the Bronte sisters in Haworth, the Keighley & Worth Valley Railway, or shop in Leeds city centre. Located right at the heart of the M1/M62 motorway network, Cedar Court Hotel Leeds/Bradford is in perfect proximity of both these vibrant Yorkshire cities.